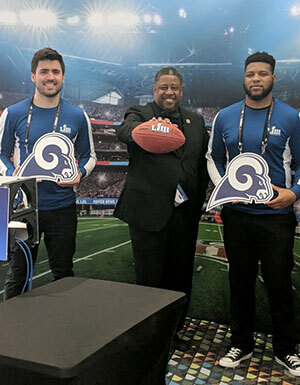 Several members of the Sports Management program got the thrill of a lifetime last weekend when they worked Super Bowl events in Atlanta. Dr. Preston James IV, Assistant Professor of Sports Management and Business Law, said the college had about 40 students assisting in different areas. They were divided into two teams – the A Team, made up mostly seniors, and the B Team, freshman and sophomore members of the Sports Management Club. The Hall of Fame party was more exclusive, with ticket prices at $15,000 each. Its centerpiece was a display of 52 Super Bowl rings. Senior Colton Stairs said the experience far surpassed anything he could have imagined. Colton said he worked for guest services at Super Bowl Live. “I was responsible for answering questions from guests and letting them know about all the events and activities,” he said. On game day, Colton’s group worked with the On Location experiences in the Thomas Murphy Ballroom at the Georgia World Congress Center. At one point, Dr. James introduced Drew to Hall of Famer Davis. Although there were about 20 sports management programs at the Super Bowl this year, only six were given Game Day, primetime experiences, Dr. James said. 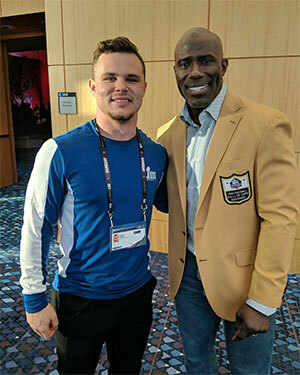 He said the opportunities to work at big sporting events with the Atlanta Falcons and Atlanta United have equipped his students to think on their feet and be prepared for anything. 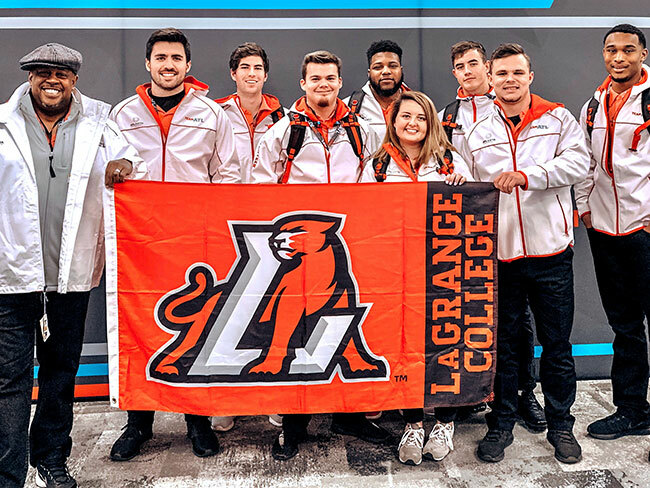 In fact, the work the LaGrange College students did at last year’s Super Bowl in Minneapolis got the attention of this year’s organizers. Colton said his Super Bowl experience offered much more than the chance to be at one of sports’ greatest events. He said he has become increasingly comfortable in situations like the Super Bowl, enhancing his chances of being hired in the field he loves. The Panthers (13-11, 7-8 USA South) rolled past Wesleyan 95-20 on Wednesday. Marilauren Farr and Nadia Montour tied career highs with 27 and 14 points respectively. LaGrange (14-7, 10-4 USA South) lost 79-76 to Covenant last Saturday. Travis Thompson tied his career high with 30 points. The Panthers open the 2019 season today (Friday) against Birmingham-Southern at Cleaveland Field in Williamson Stadium. Game time is 5 p.m. LC is ranked No. 24 in the Perfect Game NCAA Division III preseason poll. Baseball vs. Birmingham-Southern, Cleaveland Field in Williamson Stadium, 5 p.m.
Dr. John Cook, Professor of Religion, recently had the second edition of his book, “Crucifixion in the Mediterranean World,” published by Mohr Siebeck in Tübingen. Jerry Wilkinson, benefactor of the Wilkinson Family Servant Scholars Program, will share his thoughts on and experiences with service and servant leadership, as well as his principles of a successful life at 11:15 a.m. Thursday in Dickson Assembly Room. His family’s donation to Servant Scholars has helped fund guest speakers who will expose students and the community to ideas and discussion on community service, servant leadership and different leadership styles. This weekend is the annual Presidential Scholars Day that features top students from high schools around the region. There are 137 scholars registered for the event. Welcome to campus.